Christmas movies are a dime a dozen. By my count, there's somewhere around ninety movies that involve the holiday season in some fashion. And everyone has their favorite, too. Some choose the traditional classics like It's A Wonderful Life or Miracle on 34th Street, while others go for one of the million versions of Charles Dickens's A Christmas Carol. But more than a few people go for Christmas movies that are a little more off-kilter like National Lampoon's Christmas Vacation, or even Die Hard and Gremlins. But one Christmas movie that I believe just about everybody can agree on is A Christmas Story. It's one of those rare films that holds both a devoted cult following as well as a spot on the colorful list of timeless movies that everyone can enjoy. Watching it has become something of an annual Christmas tradition for this reviewer, so let's see what makes A Christmas Story so special. It's Christmastime in Indiana circa the pre-WW2 1940s, and all Ralphie Parker (Peter Billingsley) wants to find under the tree on the big day is a BB gun. Not just any BB gun, but  as he describes it  "an official Red Ryder, carbine action, two-hundred shot, range model air rifle, with a compass in the stock and this thing which tells time." This weapon of choice is the center of Ralphie's world, and despite every adult in his life being absolutely convinced that he'll shoot his eye out, Ralphie will go to any lengths to acquire it. He'll hide newspaper advertisements where his parents are sure to see them, make up wild stories about grizzly bears being spotted in the area, write an essay about it in school, blatantly state his desire for it to anyone who will listen, and as a last ditch effort, stand in line for hours just to ask an impatient department store Santa Claus for the BB gun. But little does Ralphie realize that in the midst of his obsessive quest for the holiday Holy Grail, he's having the best Christmas of his young life. His curmudgeonly father (Darren McGavin) engages in battles of epic proportion the family's bothersome furnace, loathes the army of at least 785 smelly hound dogs owned by the family's hillbilly neighbors, and wins what he calls a "major award"  an absolutely hideous lamp shaped like a woman's leg. Ralphie's mother (Melinda Dillon) struggles to get his goofy little brother Randy (Ian Petrella) to eat like a normal kid, while simultaneously trying to hide her extreme mortification with her husband's major award. And over the course of this particular Christmas, Ralphie learns that triple dog dares and the "F-dash-dash-dash" word are nothing to be toyed with, that Ovaltine may be sneaking lame advertisements into Little Orphan Annie broadcasts through secret decoder pins, and that local bully Scut Farkus (Zack Ward) may not be as tough as he seems. One of the reasons A Christmas Story is so wonderful is its innocence. It captures a time when Christmas defined everything that was great about childhood. There's also the nostalgia factor, as well. Almost every single one of us has been Ralphie's shoes on one Christmas or another, wishing upon a star for that one present that would solve all of the world's problems. And there really is a lot of Ralphie in all of us. From his family and friends, to his experiences in school, to his silly, almost outrageous fantasies, we've all been there before. The movie isn't preachy, it isn't heavy-handed, it simply is what it is: a movie for kids and kids at heart. Director Bob Clark is no stranger to Christmas movies, having previously helmed the 1974 horror classic Black Christmas, and his work here on A Christmas Story is inoffensive. It isn't revolutionary, but Clark's direction does give the movie a certain nostalgic feel necessary to make it work. Meanwhile, the score composed by Carl Zittrer and Paul Zaza is fun, bringing the viewers into each moment with a sense of childlike glee. But where the movie really shines, however, is its screenplay and its cast. Drawing inspiration from Jean Shepherd's anecdotal short story collection In God We Trust, All Others Pay Cash, the screenplay penned by Shepherd, Clark, and Leigh Brown is hilarious. It never once loses us or insults our intelligence. We can see glimpses into our own lives with these characters. We know people like them, or in some instances, we are people like them. This is reinforced by the absolutely wonderful cast. Everyone in the movie is on their A-game. Peter Billingsley is engaging and entertaining as Ralphie, a typically impetuous kid that thinks his harebrained schemes can outwit any adult. Everybody's been there before, which makes both Billingsley and the character itself that much more exceptional. Jean Shepherd himself enhances Billingsly's performance, narrating as an adult Ralphie in a style later borrowed by The Wonder Years. (Sadly, there is no Winnie Cooper to be found in A Christmas Story.) Shepherd's sardonic narration adds to the movie's fun, giving it an air of an adult reminiscing over "the good ol' days" while comically making the smallest of events sound as epical as Homer's Odyssey. Ian Petrella is fun as Ralphie's little brother Randy, and the rest of the cast is great in their own ways, but perhaps the best performances in the movie come from Ralphie's parents, Darren McGavin and Melinda Dillon. Their characters are the complete polar opposites of one another, which only serves to make their performances even more amusing to watch. McGavin approaches "the old man" (as the adult Ralphie is wont to call him) as a gruff Mr. Fixit type that earnestly loves his children, but seems more at home changing a tire or working on the house's furnace than he is showing affection. Dillon, however, plays Mrs. Parker as the typical kind of mother that's in charge of the things that don't fall into the father's jurisdiction. Which means that while the old man makes sure there's a roof over their heads, Mom will take care of everything else. Mrs. Parker mom is a little overprotective  she's the first one to warn Ralphie that he'll shoot his eye out, she bundles up Randy so tightly that he can barely move  but Dillon's performance is full of warmth, which greatly ups the quality of the character. Their performances are charming and hilarious, which I found to be evidenced in one particular moment. After the old man's "major award" is accidentally shattered, he desperately tries to piece it back together by any means he can. While he makes his failed attempt, his wife merely sits in the background, trying to keep from giggling. It's a scene that seems to sum up their entire relationship, and McGavin and Dillon play the scene perfectly. 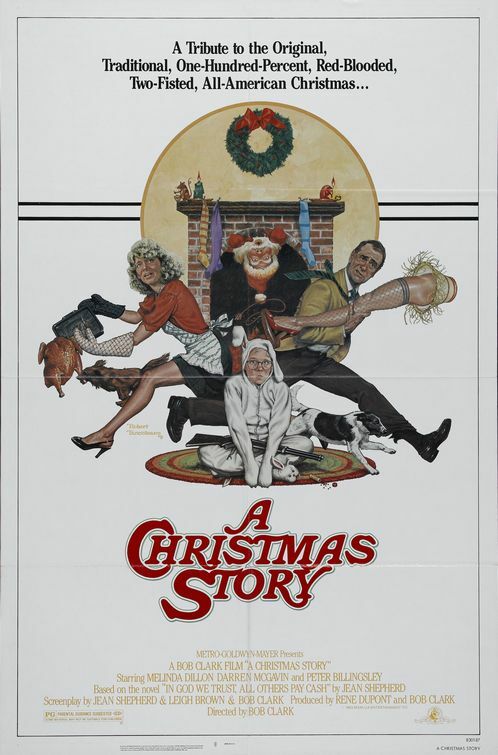 I've seen A Christmas Story described as "the Seinfeld of Christmas movies," and I like that label. I think that could be the reason why the movie is continually brought up as a prime example of a great Christmas movie. It doesn't seem like there's much of a plot in the conventional sense, but A Christmas Story never once tries to be more than a story about a ten-year-old boy's Christmas. And I believe it did a great job at that. So I'm going to give A Christmas Story four and a half stars and a proud seal of recommendation. And I dare any movie nowadays to try and get away with bits like that Chinese restaurant scene. It just couldn't be done anywhere but the '80s.